Guardians Of The Galaxy, Vol. 3 is moving forward without James Gunn, though, rest assured, his vision won’t entirely be absent from the sequel. 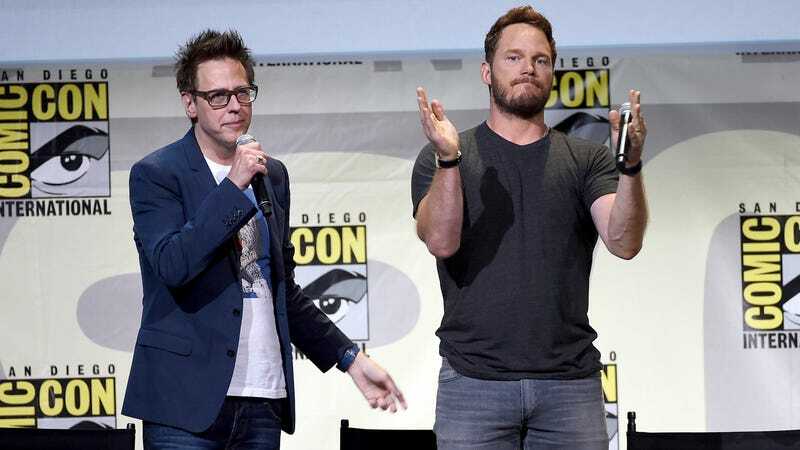 Star-Lord himself, Chris Pratt, has confirmed in a new interview with MTV News that, despite firing him over old, offensive tweets, Disney and Marvel are moving forward with the script Gunn turned in before he got axed. “It’s off the chain, it’s so good,” Pratt said, positively beaming. He trips up a bit, though, once the interviewer asks him about making the movie without Gunn at the helm. “Well, I love James and I’m loyal to James,” he says before quickly pivoting away from both Gunn and the inevitability of a new director and into some vague studio speak. “We’re gonna deliver the movie. We’re gonna give the fans what they deserve,” he says. “It’s in the nature of the Guardians Of The Galaxy to get the job done, and that’s what we’re going to do.” In other words: We don’t like it, but we’re contractually obligated. There’s also the chance that one cast member won’t even return without Gunn at the helm. Dave Bautista, who plays Drax, has made no secret of his objections to Gunn’s firing, decrying Disney and saying he’d happily join Gunn’s potential Suicide Squad “relaunch.” Maybe Gunn’s script will be enough to keep him around? What’s in that script will remain a mystery for now, but we’ll at least be able to catch up with the Guardians—or, at least, Rocket Raccoon—when Avengers: Endgame hits theaters on April 26.